Many of you may have recently become familiar with Svalbard after watching the latest TV sensation ‘Fortitude’ which is based on the islands. The Svalbard Archipelago is situated mid way between continetal Norway and the Norrth Pole and well within the Atric Circle. The capital of the islands and the base for this rather amazing Redbay creation is Longyearbyen which is the home port of ‘Better Moments’ a new and very exciting Redbay customer. Specialising in ski mobile tours during the long winter months Niklas and Eivind the owners of Better Moments wanted to come up with a summer activity which would engage their customer with the wilderness and wildlife of this very special place. The boat was the safest and most logical choice. It can hop between islands and guests are guaranteed to see Polar Bears playing with their cubs on the shore and whales jumping on the sea whilst in a warm and safe environment. The new boat has several unique design features including outboard propulsion which is a first for the Stormforce 12 cabin range. 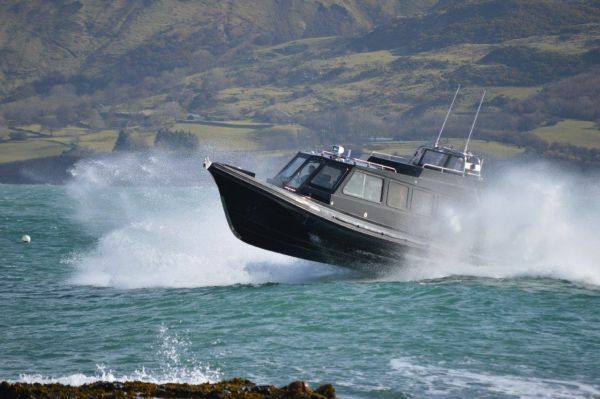 Powered by 2 x Yamaha F350 outboards the boat jumps with ease to a top speed of 42 knots and offers the customer a very exhilerating experience from the comfort of a warm and dry wheelhouse. The boat is fully equipped with all the creature comforts and safety equipment required to carry 12 persons and 2 crew in what is a harsh and inhospitable environment. We would strongly advise that you visit the better moments website to get further info on this amazing place ( www.bettermoments.no ), who knows where your next holiday might take you! !